Becoming Remarkable is Now on Audible! The moment many of you have been waiting for is here: my latest book, released last September, is now available on Audible! We have found that Audible is the best medium for an audio book, and you can find it right here: http://amzn.to/1T0YCug. It will NOT be released on CD, as it has become an archaic (and expensive) medium, and Audible accounts are free, and even have a subscription model. Now that I’ve managed to get this done, I promise to start blogging regularly again! After a year of writing and editing, my second book has finally been published. 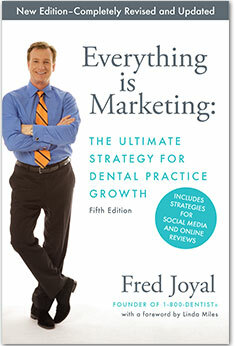 It’s called Becoming Remarkable: Creating a Dental Practice Everyone Talks About. It takes the ideas in my first book to the next level. It’s called “Becoming Remarkable” because that’s what you literally have to be. Your practice experience has to be so amazing and unique that people can’t resist talking about you. That has become more important than ever because when people talk now, they do it with their thumbs. They post it somewhere, whether it’s on Facebook, or Yelp, or as a Google review. They are adding it to your online identity and reputation, and it’s searchable, likable, sharable, and perhaps most importantly, undeletable. I love signing books. It’s very flattering to an author when people ask. Some of you may find my various suggestions and predictions controversial. But I’ve never been one to shy away from the debates about the industry’s direction. I’m passionate about the future of dentistry, and the urgency to evolve and grow. I also feature six remarkable dentists and their unique stories and approaches. What I found striking was how differently they all approached their practices, except for one thing: the patient always came first. I hope to discover many more remarkable dentists in the coming months, and will feature their stories in this blog. Meanwhile, I hope you take the time to read my new book, and that it gives you insights and practical tools to build and maintain a remarkable practice over the coming decades. You can order it here, or buy the Kindle version on Amazon. I’m recording the audio version next week, so it won’t be available for about a month. Hey, I’ve been busy! SEO: Can You Ever Stay Ahead of It? Every business dreams of coming up on the first page in an organic web search. And every day I talk to dentists who want to improve the SEO of their website. All while Google keeps changing how the results look and what satisfies their search algorithms. They just did it again on August 6th in a fairly big way. 1. The map results on computers now only show 3 practices. This now mirrors what happens on mobile phones. 2. The full address of the practice is gone. 3. Everything “above the fold”–what is immediately viewable on a computer screen–is now essentially paid for. There are still listings of organic results on the first page, meaning if you scroll down you will see them, and not have to click to see the next page of results, but in this particular search Yelp had the first three “organic” positions. This is because they know how to maximize SEO, and can spend hundreds of thousands of dollars making sure they are doing everything that Google wants. You can’t do that. Also, notice that on the right the paid ads do get their address to show up. And they can even offer specials or a have a specific message. But clearly Google makes it easy to get to the paid advertisers’ websites. And you can be sure that the bidding for those places is escalating all the time. Face it, when you have 80% of dentists who now have a website, they’re not all going to show up on the first page organically. It’s not physically possible, and clearly getting more challenging all the time. So what should your strategy be? You still need to find as many ways to create good SEO as possible. But don’t fall for some company guaranteeing that they can get you on the first page. There are too many factors out of anyone’s control. Read my previous blog on this for more insight on that. It’s more true now that ever. 1. A dynamic website that allows you to change content easily yourself and have constant new content feeding to it automatically. It should be simple, modern-looking, and easy to navigate. 2. Reviews are powerful content, and if you are surveying your patients using PatientActivator or some other application, then you can have those appear automatically. 3. Embed Yelp reviews in your site. It will only show three, but it will keep people from leaving your website and going to Yelp to see reviews. 4. Add new patient testimonial videos every week. 5. Write a blog, and link it to your website. It should have your town included in most posts, as well as some key dental phrases. Your blog is for Google to read. Most humans won’t. So being local and with relevant words is what matters most. 6. Make sure all the directories across the web have the exact same information about your practice. ReputationMonitor, which is included with PatientActivator, makes it much easier to do this. 7. Have a form where patients can request an appointment. 8. Make sure your website is responsive, meaning it plays properly on every device–particularly mobile phones–and in every browser. The first test is to look at your website on your own phone. Easy to read? Pretty? Better be! But overall, concentrate on giving a great patient experience, because your website is only one part of your promotion and practice awareness. Social media and review sites will play a larger and larger part of that with every passing month. It all has to work together, with your website as the hub. And what patients post out there matters more than ever. We build websites with our WebDirector product, but there are other reputable companies out there as well. You can tell who they are because they don’t promise magical results. We will also help you integrate all the social media aspects that you need to make everything look consistent and connect to each other. It’s a daunting, moving target, I know. But it’s the way of the world, and ignoring it or thinking it doesn’t relate to your neighborhood is going to prove to be failed strategy. So stay on it! Here are some up-to-the-minute changes in social media. Your activity, likes, and recommendations on your Facebook page are no longer indexed by Google. No one knows exactly when this happened, but it’s over. So you get no Google juice (my term for SEO) out of your activity. This doesn’t mean you stop using Facebook. It’s still the best medium to show the experience of being a patient of yours. On April 21, Google is modifying its algorithms (how it ranks websites) with respect to mobile sites. If your mobile site is not responsive or reformatted to play well on mobile devices, it is going to hurt your ranking. Not the first time I’ve told you how important the mobile version of your website is. 74% of consumers will abandon your mobile website if it takes more than 3 seconds to load. Not the second time I’ve told you how important the mobile version of your website is. More than 60% of web searches begin on smartphones, by the way. Videos now start playing automatically on Facebook as people scroll down their wall. (Unless you turn the function off.) This is engaging FB users in a big way. How big? Well, media analyst Socialbakers’ recent study showed video has twice the organic reach on Facebook as photos. And Facebook also has twice the number of videos with 1 million views that YouTube has. That’s serious. Because of this, I maintain that patient testimonial videos are your best marketing tool. Also, make sure you post natively on Facebook, which means don’t link a YouTube video or other URL source, upload it using Instagram or straight to Facebook with your computer or device. If you don’t know how to get them done, read this blog post. That’s it for now. But expect more changes. Social media is a rapidly moving target. And of course, if your website isn’t playing right on mobile, check out WebDirector. I wholeheartedly agree when you say, “It (social) is still the best medium to show the experience of being a patient of yours.” Spot on! However, in addition, there ARE SEO benefits that result from social media activity. We see it with our clients all the time. Oh, BTW, if anyone wants to read Cyrus Shepard’s post, here is the link: http://moz.com/blog/seo-myths.